Katie's Favorites: Eat your veggies . . .
Eat your veggies . . .
One of the best things I ever learned from watching Barefoot Contessa is her method for cooking vegetables. It works beautifully for asparagus, zucchini, squash, brussel sprouts, bell peppers, etc. SO simple, and so delicious! 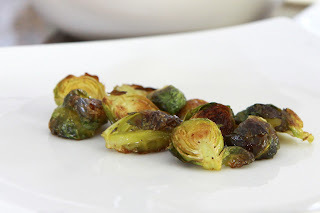 I'd never eaten brussel sprouts before, so I decided to use Ina's approach and they turned out delicious. Roasted so all the natural sweetness comes out. My family loves veggies this way, too. I cut most veggies into bit size pieces, but I leave asparagus whole. Toss vegetables with just enough olive oil to coat. Season with salt and pepper. Roast on a sheet pan in a 400-degree oven for 15-25 minutes or until tender crisp. Yum! Those look delicious! I like to saute my brussel sprouts in a bit of bacon grease with craisins and pecans mixed in. I'll have to try roasting them next time.